Amritsar: Nayati Healthcare announced the laying of the foundation stone of a 1100+ bedded facility in the hands of His Holiness Swami Avdeshanand Giri ji Maharaj. The ceremony was attended by over 700 people including renowned clinicians from across the country, leaders from the community, industrialists and many other dignitaries. Built in 15 acres, the first phase of the medicity will have 561 beds operational of the 1100+ beds. Nayati Medicity Amritsar aims to be the hub of Centers of Excellence that will match the best in the world with its infrastructure, technology and expertise. From Cardiac care, Cancer, Trauma, niche orthopedic and Neuro surgeries, minimal access to organ transplant and robotic surgeries, Renal sciences and Dialysis, Mother and Child Health including IVF, Gastro sciences and Hepatology, Pulmonology, Paediatric and Neonatal critical care, comprehensive Internal Medicine, Advanced Anesthesia and Pain Care, the latest in Imaging, Laboratory and Transfusion Medicine, to Mental Health and Rehabilitation, all services will be available under one roof such that people don’t have to travel to Delhi NCR or anywhere else for quality healthcare. “We believe that advanced medical facilities should not be confined to metropolitan cities only and should be accessible to all particularly those in tier 2 and tier 3 cities. With this thought we’ve come from the birth place of Krishna to the holy land of Gurus. Amritsar is particularly special to me, as my parents were born and brought up here , this is my home. I always wanted to serve my community. 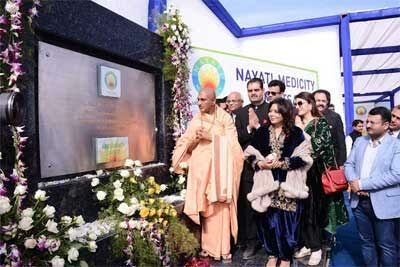 Nayati Medicity, is envisaged to be a landmark in the healthcare delivery. Amritsar was once the hub of medical tourism and through this state of art facility we intend to cater to the region and the bring Amritsar on the Medical tourism radar of the world..” She further added. In his closing remark, Rajesh Chaturvedi, Co-Promoter Nayati Healthcare stated “We are pleased that we have reached this important milestone and look forward to seeing the new hospital up and running, providing the best possible quality care.Our aim is to reduce the physical, emotional and economic burden of illness that blights the life of ordinary people in Tier II and Tier III towns.